Carlton, Essendon and Geelong scored important wins today. Draws may well cost Melbourne Uni and Camberwell Magpies in the long term. A big win to Essendon over Melbourne at the Albert Ground has seen the Bombers jump into second spot on the ladder. 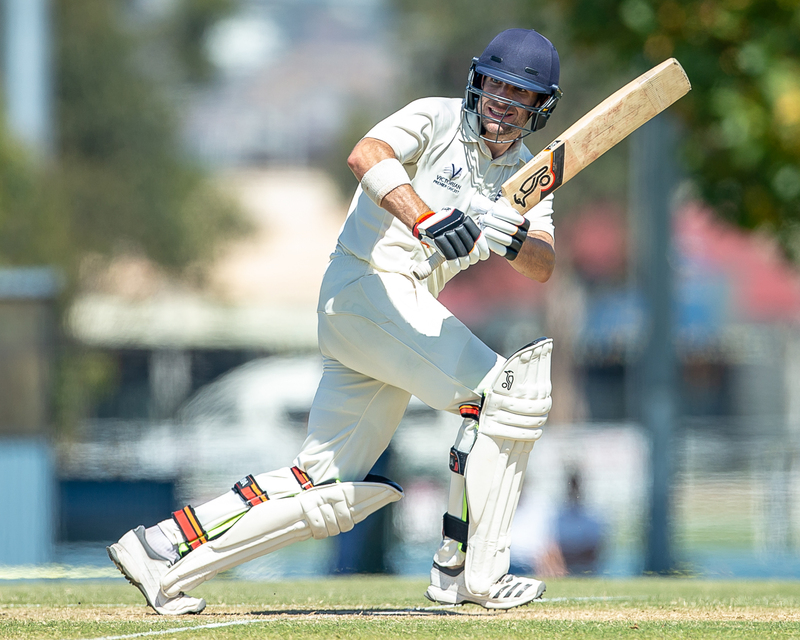 Chasing Melbourne's 5(dec)347, James Seymour saw the Bombers away to a brilliant start with a blazing 106 off 112 balls with 11 fours and 3 sixes. Aaron Ayre (67), Michael Hill (89) and Justin Galeotti (73*) continued to flay the Melbourne attack in a great chase. It was Seymour's second century of the season and his third for Essendon. Carlton has maintained top spot on the ladder with a comfortable win over Monash Tigers at Central Reserve. Donovan Pell (82) and Harrison Smyth (59) ensured there were no hiccups in the Blues' chase of 189. Carlton ended at 8/261. Dandenong overtook Fitzroy Doncaster's 156 at Shepley Oval. Resuming on 4/102, the Panthers slumped to 7/145 before James Nanopoulos (48) and Akshay Buch (41) added 56 for the eighth wicket to see their side safely home. 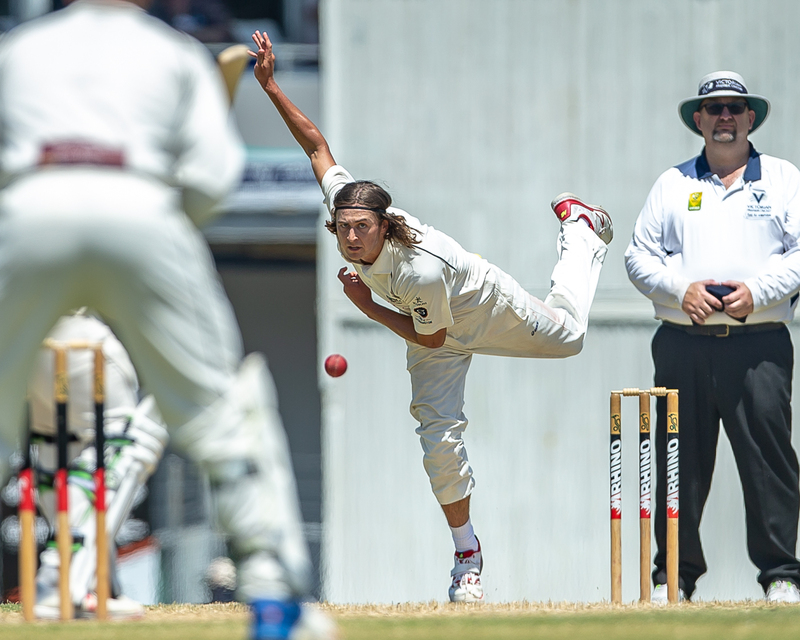 Sam Elliott (5/58) recorded a maiden five-for, while Trent Lawford (4/65) completed a good personal double. 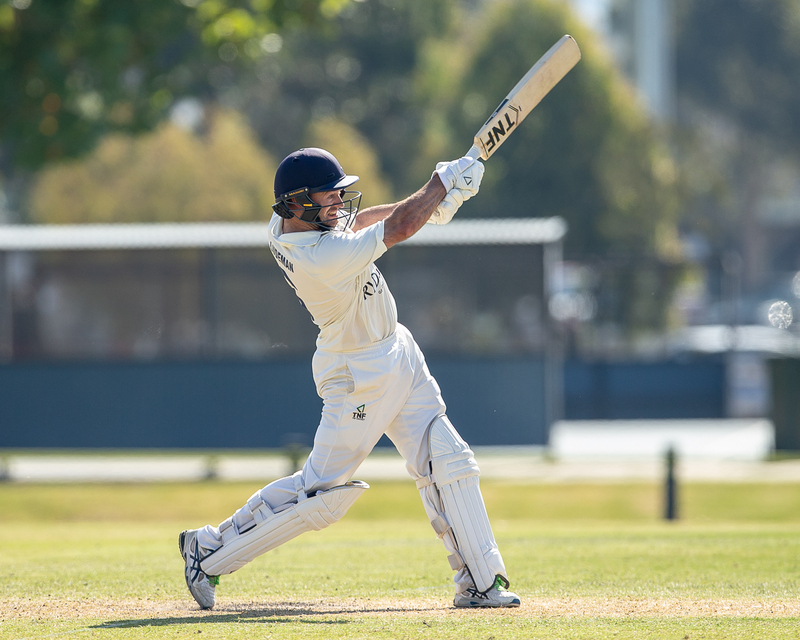 Geelong recorded a good win, chasing down Prahran's 290 at the GCG. Angus Boyd (80*), Tim Ludeman (53), Eamonn Vines (56) and Hayden Butterworth (36) all made important contributions. Ringwood won a low-scoring match at Russell Lucas Oval against St Kilda. Chasing Ringwood's modest 184 the Saints appeared gone at 7/57, but skipper Michael Beer (38) added valuable runs with tail-enders Todd Murphy (20) and Shea Gribben (25*), lifting the total to 141 before Michael Topp (5/36) took the last three wickets to wrap up the win. Frankston Peninsula hauled in Northcote's 195 at Bill Lawry Oval. Rob Salerni (75* and Tom Wood (37*) saw the Heat home with an unbroken 56-run stand for the fourth wicket. Two thrilling draws finished off Round 12, along with a Greenvale Kangaroos win over Kingston Hawthorn. A gallant fightback from Casey-South Melbourne keeper Devin Pollock (104) saw the Swans draw with Melbourne Uni at Uni. The Students scored 332 last week and, although Casey-SM never looked like chasing the target down, Pollock's defiant knock enabled his side to an honourable draw. Pollock was dismissed, bowled by Steven Reid at 9/267, but Josh Dowling (1* off 37 balls) and Jackson Fry (6* off 20 balls) held out to reach 9/273. It was Pollock's second Premier century - he also scored 104 against the Heat in 2014-15. Similarly Footscray held out for an exciting draw against Camberwell Magpies at Merv Hughes Oval. Matt Underwood (90) was in good form early, but wickets tumbled and, when Lucas Dredge (0) was bowled by Fekete, it was 9/246. Hamish Winter-Irving (24* off 42 balls) and Jack Sheppard (1* off 15 balls) held out the Magpies' attack for the draw. Ladder: Melb Uni 52 St K 49 Ess 49 Camb Mag 42 Fitz Donc 41 Foot 29 Mon Tigers 28 Melb 27 Carl 27 Prah 26 Dand 26 Ncte 25 Geel 22 Frank Pen 18 Ring 17 Casey-SM 13 Green Kang 12 King Haw 4. Ladder: Mon Tigers 44 Ring 40 Foot 34 Prah 33 Frank Pen 33 Melb 32 Camb Mag 31 Melb Uni 31 Ncte 31 Geel 30 St K 24 Dand 20 King Haw 18 Ess 16 Carl 16 Casey-SM 15 Fitz Donc 10 Green Kang 4. Ladder: Melb 49 Carl 44 Casey-SM 42 Mon Tigers 38 Ess 36 St Kilda 32 Ring 32 Fitz Donc 31 Dand 30 King Haw 20 Camb Mag 19 Geel 19 Ncte 18 Frank Pen 16 Green Kang 15 Foots 14 Prah 10 Melb Uni 10.